While knowing your blood pressure, cholesterol, and glucose numbers are all important, perhaps your most important health number is the one you probably have never heard about. Indeed, heart rate variability (HRV) may be your best overall marker of health, fitness, and longevity. HRV tells you how much mental or physical stress your heart is experiencing. Fortunately, tracking this number is easy and will cost you next to nothing. In this article, I’ll teach you everything you need to know about heart rate variability. Your heart beats about 100,000 times each day. These 100,000 heartbeats aren’t perfectly timed. And having a slight variation between the timing of your heartbeats is actually healthy. Heart rate variability (HRV) is merely the beat to beat variation in timing. 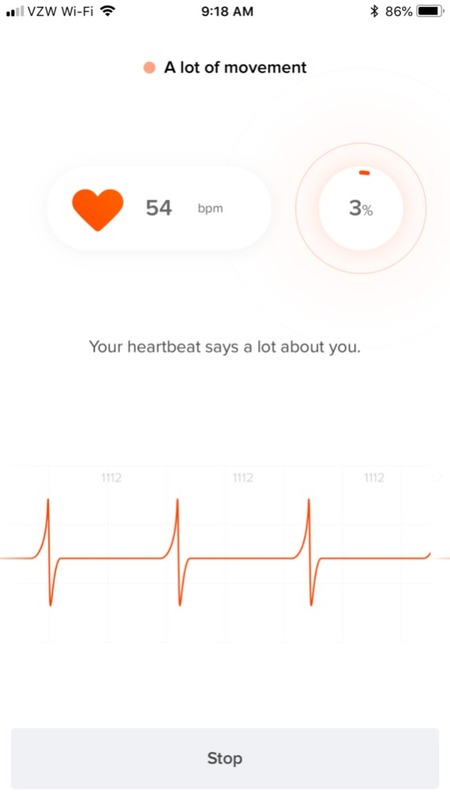 For example, even though your heart rate is 60 beats per minute, which works out to an average of one beat per second, in reality, the timing between your next five heartbeats could be 0.98 seconds, 1.03 seconds, 0.99 seconds, 1.02 seconds, and then 0.98 seconds. Why is There Heart Rate Variability? The reason why there is heart rate variability is that there is a tug-a-war going on between the two opposing ends of your autonomic nervous system. One one side you have the sympathetic response, which is the fight or flight response, that wants to rev up your cardiovascular system. On the other side, you have the parasympathetic response, which is the rest and digest response, that wants to cool down your cardiovascular system. Both responses are important. For example, you need your sympathetic response when you are physically active during the day. Likewise, you need your parasympathetic response at night when you are trying to sleep. The key takeaway is that the sympathetic response makes the heart beat fast and the parasympathetic response slows it down. When the heart is beating fast there is little beat-to-beat variation and heart rate variability is low. In contrast, when the heart is beating slow there is a much wider beat-to-beat variability and heart rate variability is high. If you’re stressed out and not exercising or eating optimally then your resting heart rate will be fast and your heart rate variability low. This is because there is nothing to counterbalance an overactive sympathetic nervous system. When the sympathetic nervous system is dominant at rest then the timing of your next five heartbeats might look something like 0.79 seconds, 0.79 seconds, 0.78 seconds, 0.78 seconds, and 0.79 seconds. For optimal health, you need a healthy balance from both the sympathetic and parasympathetic components. How Do You Measure Heart Rate Variability? Fortunately, it is incredibly easy to measure your HRV at home. While most smartwatches have built-in HRV tracking capabilities, I don’t recommend using smartwatches for this function. The problem is that smartwatches aren’t reliable because they often can’t detect your wrist pulse. The most accurate way to measure HRV is with a chest strap or finger monitor that communicates with your smartphone. While the apps are free, the hardware will set you back around 100 US dollars. A good way to test your HRV without having to buy a chest strap or finger monitor is to try out the free version of the Welltory HRV app. You can download this app for free on the AppStore or GooglePlay. This app uses the camera feature of your phone to measure HRV so no extra equipment is needed. For five days you will have full access. After the five day trial period they hide the most important HRV data unless you pay a high recurring fee. If you find HRV tracking helpful, I would suggest visiting the Elite HRV website as a long-term solution. Just find a compatible chest strap or finger monitor from their website and the app is free with no recurring charges. What Does a Low HRV Tell You? Your HRV number tells you how much physical or emotional stress your body is under. If your HRV is consistently running low, your body is probably getting crushed by excessive physical or emotional stress. When HRV is low, you are much more likely to suffer from arrhythmias, heart attacks, illnesses, and injuries. This is why world-class athletes will dial back their daily workout when HRV is low because they don’t want to get sick or get injured. What is Your Goal HRV Number? Regardless of which HRV system you choose, you will see lots of different numbers. Of these various ways to measure your HRV, the best studied is SDNN. SDNN represents the standard deviation of the beat-to-beat changes. As long as your SDNN is consistently above 70 ms then the chances of you getting an arrhythmia, having a heart attack, or having anything bad happen to your body goes way down. As long as your heart is in rhythm, meaning that you aren’t experiencing any arrhythmias, then the higher your HRV number the better. How do arrhythmias affect HRV? While you can still measure your HRV if you are having an arrhythmia (atrial fibrillation, PVCs, PACs, etc. ), the HRV number while your heart is in an arrhythmia is meaningless. This is because there are such extreme beat-to-beat fluctuations that you can’t make any sense of the data. Thus, even though you will get a sky-high HRV number when your heart is out of rhythm, it isn’t the number you want. Indeed, some studies have shown that when your HRV is too high from arrhythmias your risk of bad cardiovascular things happening to you is significantly increased. The bottom line is that for an HRV measurement to be accurate, your heart has to be in rhythm. Some variation in the beat-to-beat variation is healthy but too much, like from an arrhythmia, isn’t. Arrhythmias are often caused by an imbalance of the sympathetic and parasympathetic responses. In other words, too much fight or flight (sympathetic) or too much rest and digest (parasympathetic) can trigger arrhythmias. To minimize your risk of atrial fibrillation and any other arrhythmias, you need an optimal heart rate variability. While an SDNN of less than 70 ms puts you at risk of arrhythmia, there are no clear numbers as to how high is too high. Many of my patients have figured out what number on the high end puts them specifically at risk based on personal tracking. As excessive premature beats often lead to atrial fibrillation, I suspect PACs are the reason why they get a sky-high HRV prior to their hearts going out of rhythm. Countless studies over the last few decades have linked heart attacks and coronary artery disease with low HRV numbers. Likewise, your risk of heart failure goes up three-fold with a low HRV. While higher is better when it comes to the SDNN HRV measurement (as long as you are not having an arrhythmia), the minimum number you want to hit is 70 ms.
No one wants to die before their time. However, if your HRV is consistently low there is a chance it could happen at any time without warning. Indeed, many studies have shown that low HRV numbers and dying suddenly often go hand in hand. Increasing your HRV doesn’t just protect your cardiovascular system but your entire body as well. For example, an SDNN HRV level below 70 ms significantly increases your risk of cancer death. 5. A Low HRV Increases Your Risk of High Blood Pressure, Diabetes, Depression, etc. The key takeaway here is that because most people living in modern societies are sympathetic dominant (low HRV), you can link low HRV numbers to most chronic medical conditions. A low HRV doesn’t mean you will get any of these conditions. Rather, a low HRV simply tells you that your life is out of rhythm. Most people living in modern societies are sympathetic dominant and thus have a low HRV. While this would be helpful if we had to constantly defend our families from wild beasts, the truth is that most of us don’t have someone trying to kill them every day. The reason why most people are sympathetic dominant is really quite simple. We don’t get enough exercise, nutrition, and sleep but yet are under tremendous stress from sedentary jobs. If your autonomic nervous system is out of rhythm then your health will also be out of balance. The key is to have the right balance between the sympathetic and parasympathetic nervous system. And tracking your HRV is the best way to see if you are in balance. You make our Day everyday Dr Day.Thanks I appeal your bringing out the Truth of Cholesterol.I am Not taking Statins for last 5 years though had Herat attack in July 2011.Modt of the Cardiologists told me that I will die within 5 years if I don’t take Statins . I am following Indian Ayurvedic Life style and my formula is MYSPEED with BMW . Meditation,Yoga,Smile and Sleep well,Pranyam,Exercise, Entertainment and Diet control. Glad to hear you are doing well with a holistic way of living. Even with lifestyle optimization, please be sure to continue to work with your cardiologist so that you can minimize the chances of ever having another heart problem! A very interesting article. I’ve also researched a bit on the topic after reading your blog post. As asked in a previous comment, my question is, how does medication such as a beta blocker influence one’s HRV readings? I have seen somewhat conflicting information. My thought is that because a beta blocker tends to slow down and help to regulate heart rate, it seems logical that one would tend to have lower HRV readings. If that is the case, is a person more at risk for the health issues that are correlated with readings lower than 70 milliseconds, or does the medication render the testing invalid? Great question. In general, beta-blockers tend to increase HRV. A good way to think about this is that with a slower resting heart rate there is more time between each heartbeat so with this extra time you can have more variability. The “70” number has been studied primarily in people not taking any heart rate-controlling medications. Thank you for the fascinating info relating HRV to health! Is there a significance to the SDNN of 70 mS that makes it the goal? Was it referenced in one of the studies as a threshold? This “70” number was really just the number that was observed to be where the inflection point in outcomes was observed in a number of large studies. There is nothing magical about the number. There is not one goal HRV. HRV is based on the individual. HRV measures each person on a spectrum of Illness to Health to Fitness. It is true that low HRV is an indicator of poor overall health, but giving HRV a “number” does not apply to individuals. You need to measure accurately what YOUR baseline HRV is and then improve upon your HRV. Tracking your HRV is the best way to measure overall health and helps determine when to exercise. However, measuring HRV with a chest strap or finger monitor that communicates with your smartphone is not accurate. This does not measure HRV. You need an abdominal strap, a chest strap, and EKG (wrist or chest). With a simple 5 minute scan you will monitor HRV accurately and easily. All of this can be done in your home or physician’s office. Anything else is just guessing your HRV. You bring up some excellent points. HRV is something that is best monitored in the individual person. I know I have found tracking my individual HRV numbers against my own baseline number has been helpful. While cutoffs have been observed in large observational studies, these are merely observations. You are absolutely correct that medical grade HRV equipment is best to measure HRV. However, a number of studies have shown that consumer technology is reasonably accurate when measuring resting HRV. Is the Heart Rate Variability the same as the Resting Heart Rate? When I take my blood pressure at my local pharmacy, it gives the systolic and diastolic numbers and also the Resting Heart Rate(RHR) Number. The research that I have done on Resting Heart Rate says that the lower the number the better shape you are in. I am a 61 year old woman who does exercise and tries to eat healthy and according to the recommendation my RHR should be around 60 BPM. My number is usually around 62 or 63. You bring up an excellent point. Yes, in general, a lower resting heart rate has been associated with improved longevity in observational studies. However, as part of the aging process sometimes people develop a condition called sinus node dysfunction which can lower the heart rate and hasn’t been observed to improve survival. Also, many medications lower the resting heart rate and generally don’t improve survival with the exception of beta-blockers in systolic heart failure, large myocardial infarctions, etc. I downloaded the Welltory app. Easy to use. You place a finger over the phone’s camera and you are analyzed for about a minute. The resulting icons with numbers fills one screen, scroll to the report “What’s happening with your body? Mine said “Your stress levels are low, your body is relaxed, and you have a lot of energy. Your productivity looks fantastic”. That is what lunch does for me! After my morning fitness class and flu shot – I guess I don’t react to shots like some do. For age 71, I’m pretty happy with that. Good news is as important as what needs correction – On “How to reboot yourself”, it says, “Not much you have to do really”. It does describe more on how to use the tool with multiple readings over time and learn more about your health. You get to select words that describe what you are doing at the time of the reading. Interesting observations! You bring up an excellent point. These HRV technologies are best used in monitoring how your body is doing day to day. Let your initial reading be your baseline reading and then try to improve your score over time. I was diagnosed with paroxysmal afib a few months ago and am taking a rate control medication (diltiazem) for it (also have flecainide for pill in pocket, but have never used). Would it be of any value for me to test my HRV, or would it be meaningless in my case? Like with some of the other questions on beta-blockers, any medications that slow your heart rate change HRV. Most of the studies done on HRV are with people not taking any medications that altered the heart rate. However, even though you have an “altered HRV” because of the medications, I still feel that tracking your HRV can be helpful. For example, you can take your “altered baseline HRV” and then try to increase it over time by optimizing your daily health decisions. What effect do high blood pressure drugs like Beta Blockers have on HRV? Please read through my previous answers on this one as hopefully, I have already answered this one. Thanks for reading and for taking the time to comment!